Remember how I bought that Paul and Joe Foundation Primer just because the packaging was pretty and I had ASOS vouchers? Yeah... I may have bought this at the same time. It looks so similar that it's hard to believe it's from a different brand! 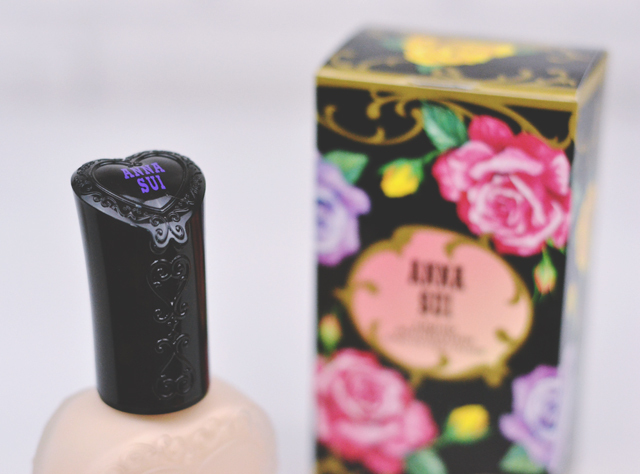 I bought the Anna Sui Liquid Foundation in 101 which isn't the palest shade they have but appeared to be the pinker of the two porcelain colours. Isn't this just the prettiest packaging you ever did see? 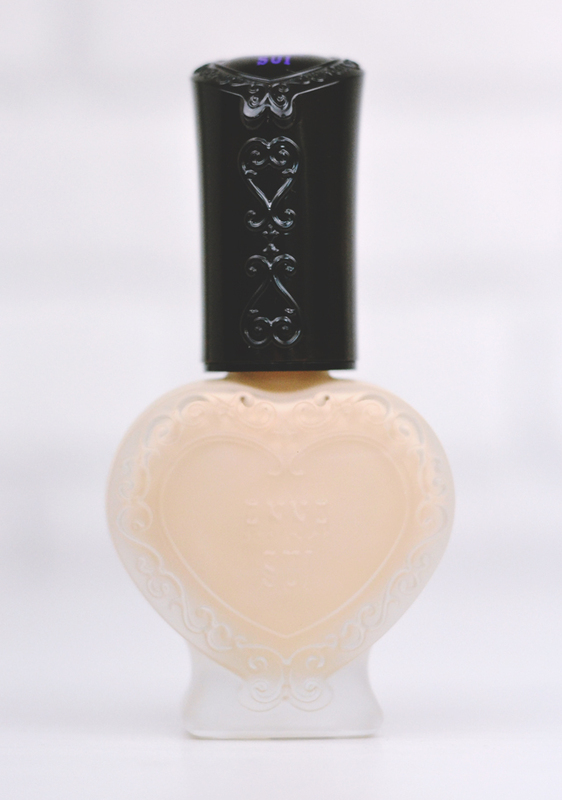 I love the gothic romance thing it's got going on and how the bottle and lid are heart-shaped. As it's frosted glass, it's quite heavy and the shape, while cute, isn't the most practical for packing in make up bags. However, it does redeem itself with the handy pump dispenser. When dispensed, the foundation has a thick creamy consistency. One pump is just about enough product for my face and it applies incredibly smoothly and evenly. Interestingly, it is rose scented and it is quite heavily fragranced so that's something to be aware of. Coverage is sheer-to-mid coverage with a matte satin finish which feels light on the face. Imperfections are hidden and it's easy to build up more coverage without any cakiness or clinging to dry patches. 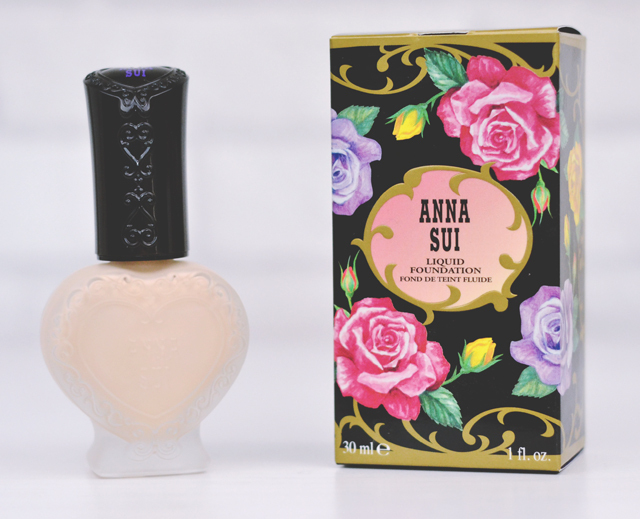 It perfectly blends into my pale pink-toned skin (more information here on my foundation shade) and stays put all day, without oxidising or transferring. This foundation is perfect for my combination (normal/ dry) skin and gives me the matte finish I desire without clinging to dry patches. The heavy fragrance is something that may be off-putting to many, but I don't mind so much. It's a sacrifice I'm willing to make for a bottle this pretty! This looks SO pretty! I'm on the hunt for a new foundation for a wedding next month, I think I may have to splurge! It might also help me sort out my makeup storage in order to show it off haha!